This radio is helpful for the following circumstances: security guard, supermarket connection, construction area indication. It is also helpful for field survival, biking and hiking. Please do not use this walkie talkie with other brand's walkie talkies. Warranty: This Proster Two-Way Radio Provides 18 Months Warranty. (3 Pair Walkie Talkies) UHF 400-470MHz, 16 Channels --- Enables to connect each other in a long range of about 2 Miles (Max in OUTDOOR Open Field, it exactly depends on your surroundings). DCS and CTCSS Function --- It can shield external interference signal and reduce noises. USB Charger --- (Your outdoor partner) Charging even you are outside with car charger/power bank.Most of your USB Charger is suitable for this convenient charging, You may use a PC charger, Car charger, mobilephone charger to charge it. Build-in LED Emergency Flashlight --- Expose yourself location to ask for help in emergency. 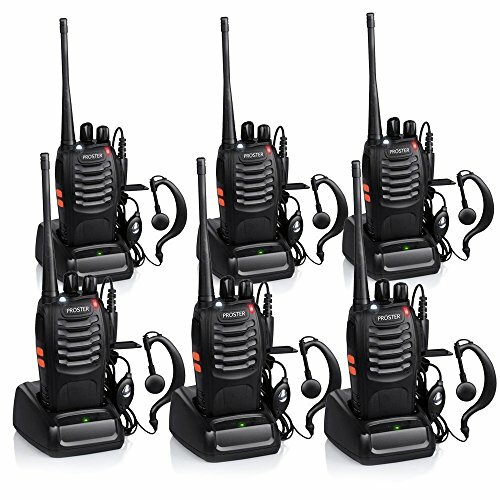 Wide Application --- This walkie talkies are perfect for security guard, supermarket connection, construction area or field/outdoor adventure and survival, biking and so on.